If you’re in pursuit for a top-quality guitar that is capable of delivering a high-end classic jazz sound without costing a fortune, allow us to kindly draw your attention towards Epiphone Broadway. This fella is a living proof that Epiphone has a way of making top-notch instruments with all the proper budget cuts. We took it out for a little spin, you can check out our thoughts in the full review below. The guitar packs a laminate maple body spiced up with a select spruce top. This is a classic jazz combination that makes the guitar a bit heavier, but secures a sonic foundation that’s light and bright. The neck is once again a strong maple piece combined with a standard rosewood fingerboard, a set of 20 frets, and super sleek so called block-and-triangle abalone inlays. The decorated headstock is called tacky by some, but we’ll let it pass as full-on classy and stylish, because that’s just our thing. As a hollow-body electric guitar, this thing has a slightly larger body that can take some time to get fully accustomed to if you’re a long-time solid-body user. The six-string utilizes a floating tremolo bridge, a set of strong tuners to keep the instrument in proper shape, as well as a set of strong tuners and classy golden hardware to spice up the mix. The guitar has a standard small pick-guard and a set of masterfully crafted tuners with zero sharp spots or buzz n’ fuzz issues. In the electronics section, the Broadway sports a set of Alnico Classic Humbucker pickups with individual Tone and Volume control knobs, along with a three-way selector switch. This is very high quality stuff for the listed price range, and we can’t think of almost any issues apart from the selector switch being a bit weak and prone to damage in the long run. Unforced and natural would be the key words to describe this hollow-body jazz guitar. The maple foundation provides a healthy load of brightness, the spruce top rounds it up with a warmer and bass-driven sonic vibe, while the pickups – despite being humbuckers – maintain the final audio output articulate and nowhere near gain-overloaded. The result is one of the best jazz sounds out there, not too imposing in the mix but still resonant and powerful enough to crack through the mix and really shine in a jazz or light blues band arrangement. For the listed price, you’ll be getting a great deal here. When it comes to best jazz guitars under 1000 dollars, we have pretty much zero reluctance about putting this bad boy on the list. From the looks to build quality to the sonic attack itself, this is a worthy purchase and pro-level instrument. The addition of humbuckers also makes the instrument strong enough to be utilized in a rock environment when combined with a proper amp, so if versatility is what you’re after, Epiphone Broadway is once again a good choice. 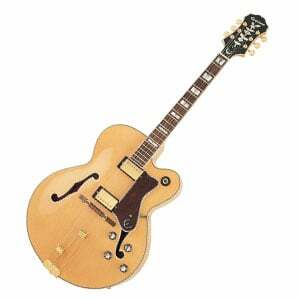 For more info about the Epiphone Broadway, click here. For more Jazz electric guitars, click here. Why was the video recorded with the protective foam still under the bridge?